Our winery, the Hopewell Valley Vineyards, has a certain style and color that most people describe as Tuscan. One thing that is most definitely clear and abundant is the element of copper in the various elements of the functionality and decoration of the tasting rooms. 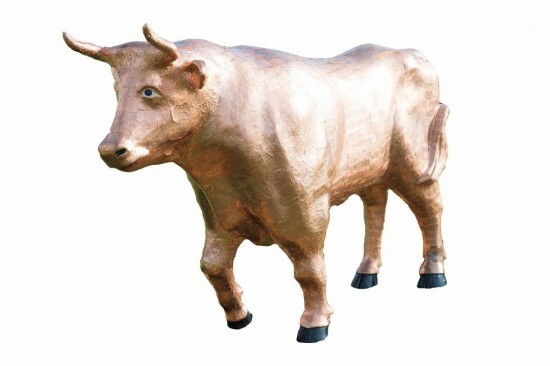 Keeping with the medium of our choice, we decided to decorate our own ox which is "dressed" in copper. Small pieces of copper, in varying sizes, are molded on the body of the beast until it was all covered. We believe the visual is quite unique and blends in beautifully with our farm, inside and out.